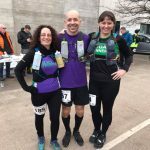 This race has been popular with Striders since its inception and Susan and I have run it four or five times – although not since 2011. As Sunday was forecast to be slightly less hot than we’ve become used to we decided to give it another go. 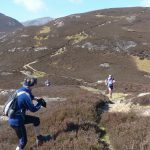 Although it’s registered as a fell race it’s really a trail race with a bit of climb (1,000’) and is mainly run on stony farm tracks with a few grassy paths. As advised for ‘on the day’ entries we arrived early and, after registering, we spent the time stretching, warming up and listening to the Commonwealth Games on the car radio. At the start we looked for other Striders and were pleased to see Richard Hocking, Phil Owen, Christine Farnsworth & Barrie Evans. However, Christine and Barrie were destined not to finish as Christine, just a mile or so into the race, took a heavy tumble on the unforgiving surface sustaining a cut lip and chin and a very swollen knee. Barrie, being the gentleman we all know him to be, escorted Chris back to the start and into the first aid tent for treatment. Meanwhile the rest of us continued round the hard, dry and dusty course hoping the sun would stay behind the clouds and things wouldn’t get too hot. 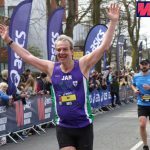 After a couple of recent tough training runs I was confident that I could hold a reasonable pace around the 8.5 mile course without having to walk any of the hills – and so it transpired. However, I started to ‘feel it’ a bit with about two miles to go. At this point I sensed another runner draw level with me. 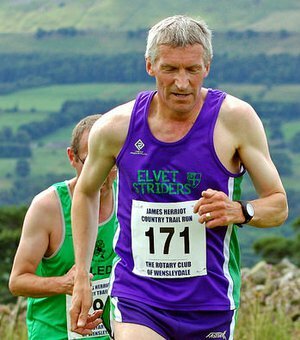 I glanced over, noticed a Durham Fell Runners’ vest and recognised a long standing adversary of mine from the fells. He went by me but I managed to ‘cling on’ and the gap between us never grew beyond 20 yards (that’s about 18 and a bit meters Rachael!). As we approached the last half mile I could see that the gap was closing. I increased my pace slightly and with around 150 yards to go I caught him. A final ‘eyeballs out’ dash took me passed him and on to the finish in a slightly faster time than three years ago. Brilliant! 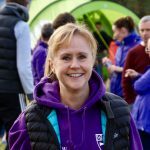 Susan too had a fantastic run finishing third in her age group (just two seconds behind the second of her vintage) and a whopping two minutes quicker than her last outing here in 2011! Things are looking good for the fast approaching cross country season! Richard came home a couple of minutes later looking strong and comfortable after a fine race – another one of us looking forward to running in the mud. 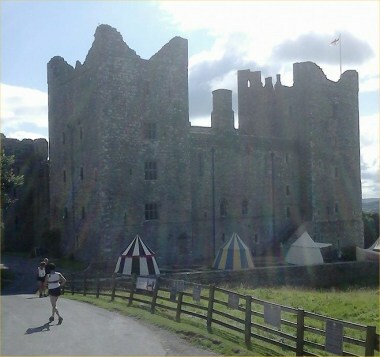 Phil continued his recovery from the West Highland Way Race (all 95 miles of it) with a steady run in the sun. So, a good day out running a very pleasant race at a splendid venue. We hope Christine’s cuts and bruises heal quickly!